My 101st post on the blog. Could have also been titled “Not the best rest and recovery” as my ribs are still aching but are now joined by my lower back. Bob Taylor and I set off last Friday morning to cross Scotland by canoe. 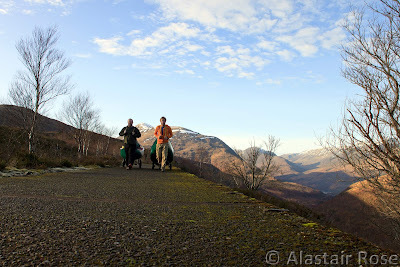 We left Kinlochleven at 11am with the boats on trolleys for the first 7km uphill portage. Actually the first 2 km are what its all about as you essentially gain most of the 300m in that distance before gaining a concrete conduit to get up to the Blackwater. 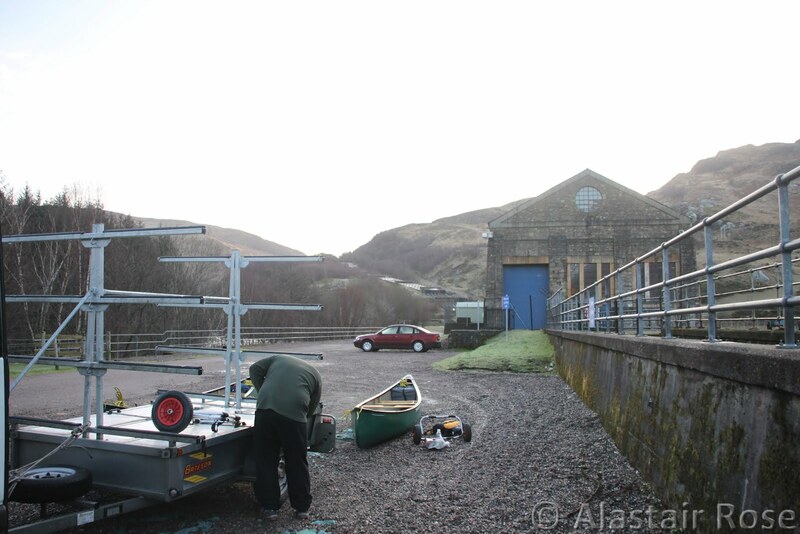 Unloading the trailer in Kinlochleven looking up at the route of the portage. It was 1degreeC when we left and never really rose any higher. This was perfect, I cant imagine what it would be like in summer pulling boats up this hill. Bob with boat heading up the first hill. Finally on some water. 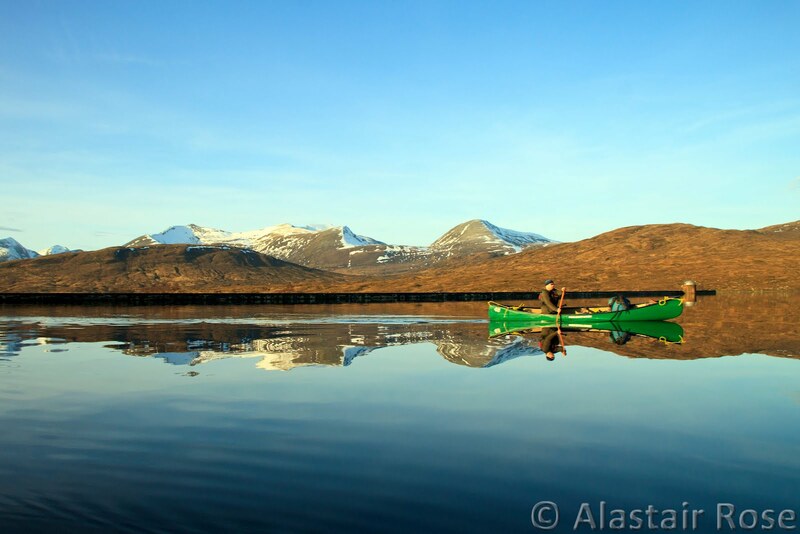 It took 3 hours to get the boats up the hill to the blackwater but it was all worth it, paddling in some flat calm on a beautiful high loch. 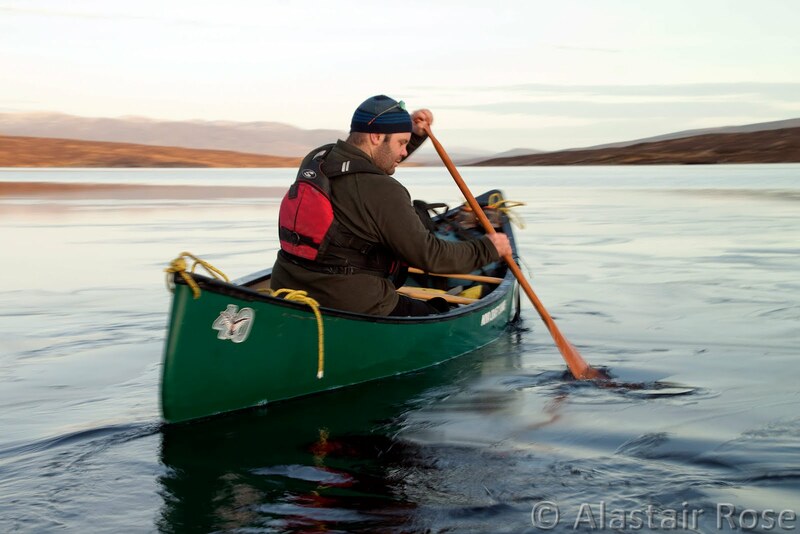 Bob with 10km of the Blackwater still in front of him late in the afternoon. 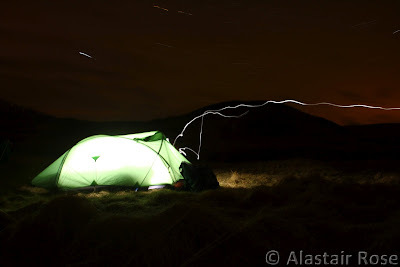 The tent lit up on the first night, camped at the East end of the Blackwater ready for the heinous portage the next day. We got up and out of camp as it got light and headed off initially trying to connect sections of the Blackwater river with each other but quickly gave up and pulled the canoes behind us instead. 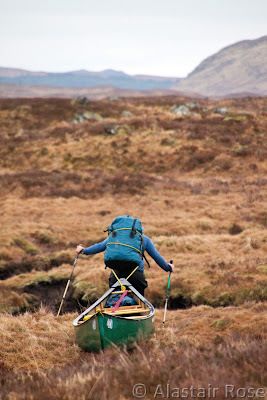 Bob contemplates another boggy section. 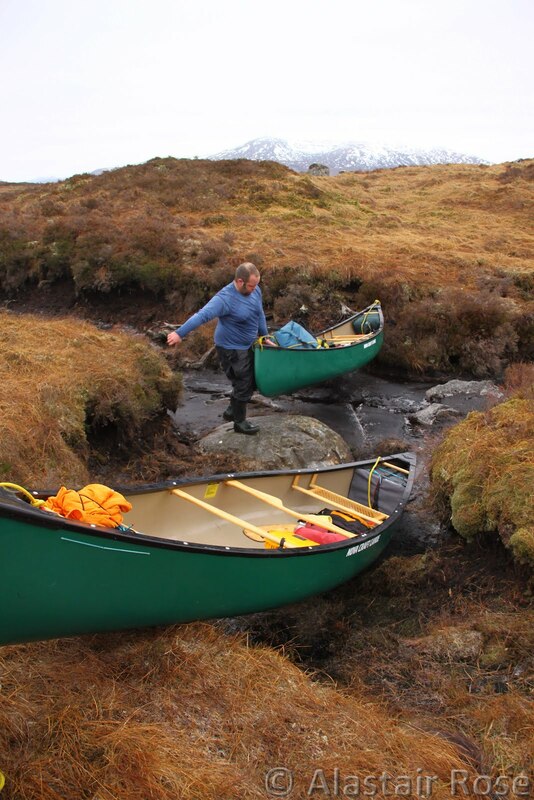 This first portage was meant to be just over 3 km but we frequently had to take the long way round small streams and large bogs. It was quite useful the ground being frozen as the boat slid pretty easily on the frozen turf. 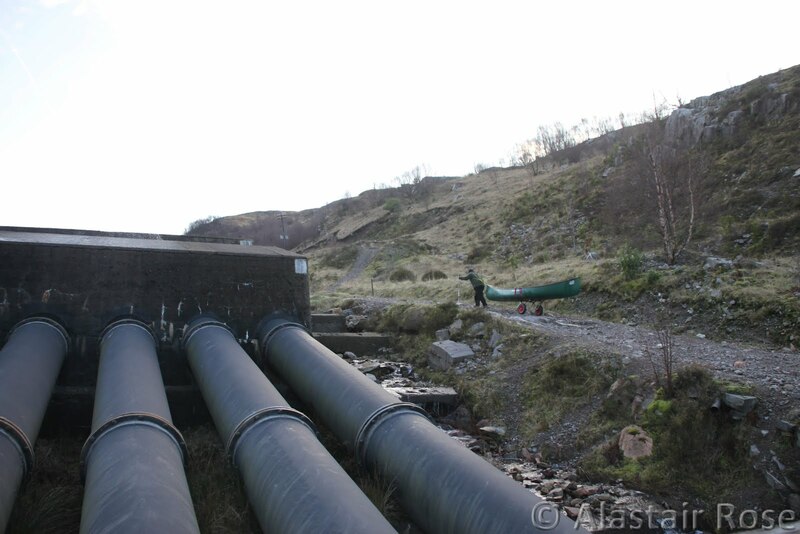 No water in sight. Potentially the highest part of the crossing getting closer to the small Lochan a’ Chlaidheimh at the top before another long portage down to Loch Eigheach at the head of the Gaur. Crossing yet another small stream – at times the boats were quite handy as you could slide them halfway across and then climb across them! We both spent much of this day imagining different contraptions that would make this easier. 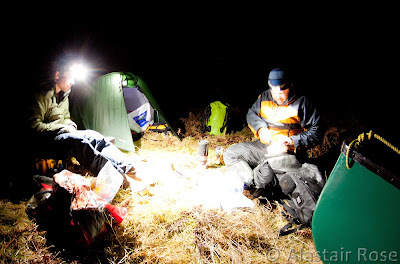 Camped on the side of the Gaur after a very long day. 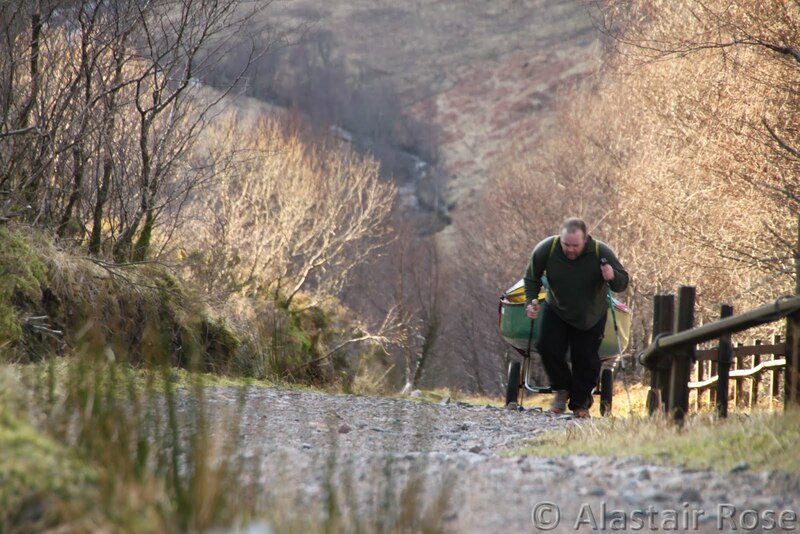 The last 600m to the road down to Loch Eigheach seemed very long indeed after dragging the boats what should have been 7.5km but was probably more like 10. We woke up to find a hard frost and temperature refusing to rise above -5degreeC and not a breath of wind. Lieing in the tent looking at the maps on the first night we had realised that we had totally forgotten about Loch Rannoch, incidentaly the largest loch we would have to paddle. We slowly got into some very cold drysuits and headed downt the Gaur river which was rather low on water. 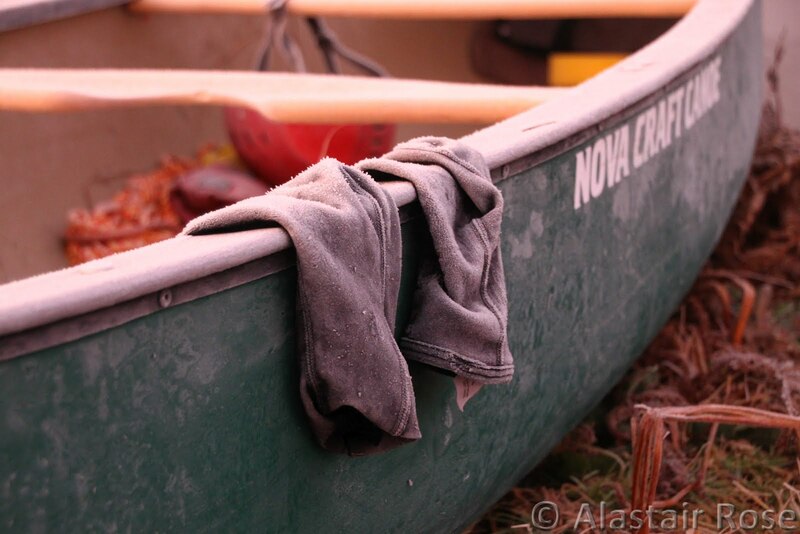 My socks frozen to the canoe. Tree at the start of Loch Rannoch in the early morning sun. 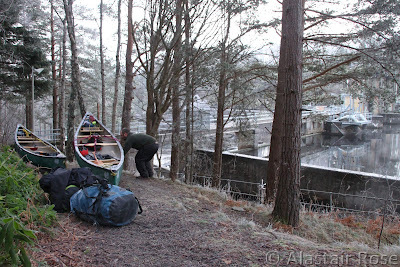 Another cold and frosty morning and another portage around a dam to get into the upper Tummel river. We scouted this portage the night before which made things go a bit quicker only to discover that there was no water in the Tummel river and all the throwbags etc were completely frozen. 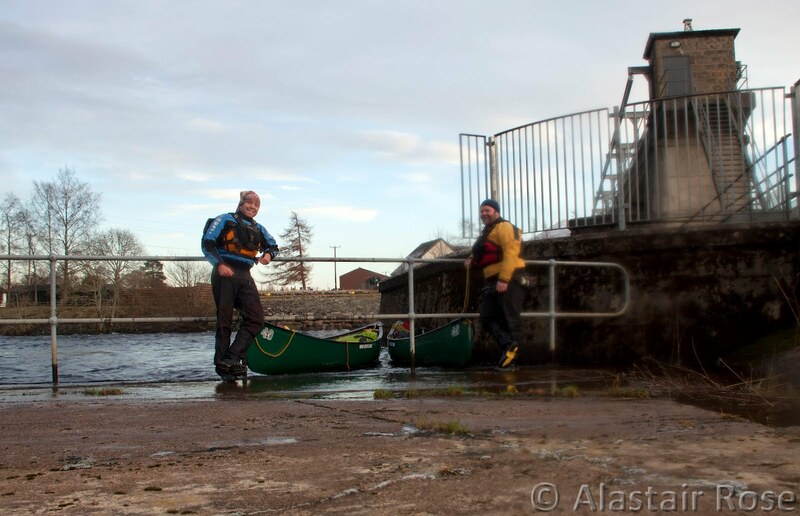 We chose to portage the hard rapids. 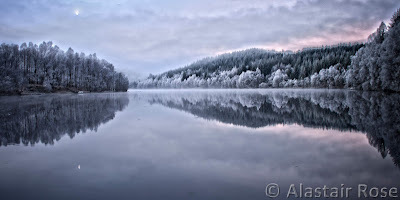 Dunalastair Water in the morning light. 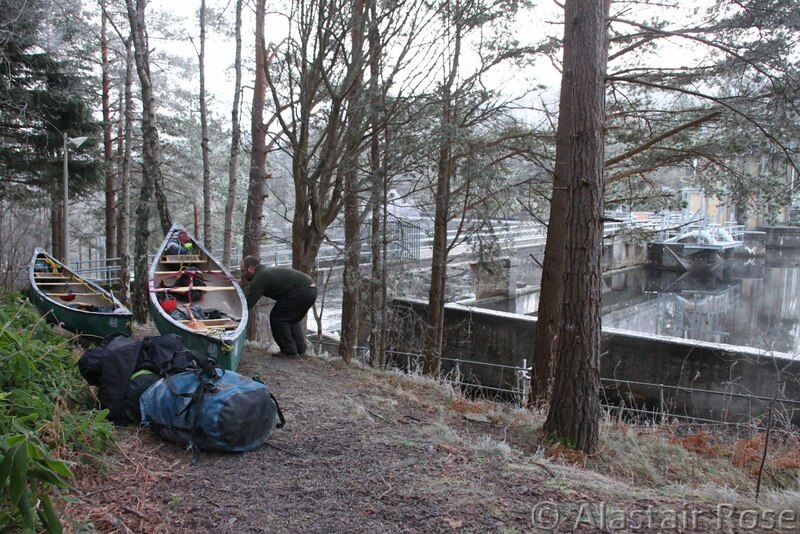 Loading the boats for the portage around the dam. Lunch on Loch Tummel Island. Finally a pint of beer in the Kingfisher pub in Pitlochry. 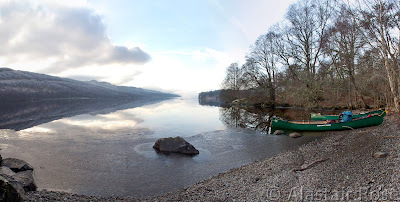 We had a couple of pints, some fish and chips and then wandered pitlochry looking for the portage route for the next morning. 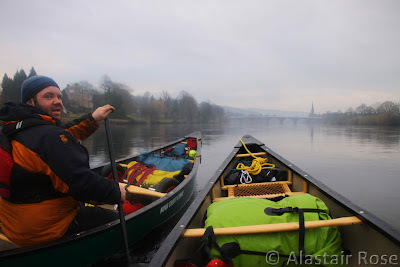 We got up early and did a quick portage of Pitlochry at 615 not even meeting any vehicles on the road and then waited for the bakery to open for some bacon rolls to keep us going. Once on the water we were able to keep a good 10km an hour all the way to perth. Approaching the bridges in Perth, the tidal limit for East Coast. Just to be sure we paddled an extra 11km down to Abernethy. Thanks to my Dad and Sister for dropping off some pies and irn bru and my dad for helping with the shuttle. 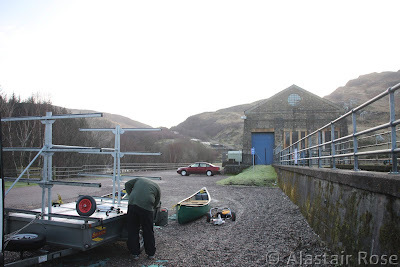 Portages – hard! there is two painful ones, one on the first day and the other from the blackwater to the gaur. The uphill portage on day one is tough to start but the last 5 km are really pleasant. 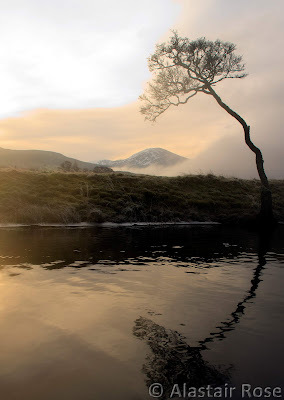 Timing – We both thought winter would be better. 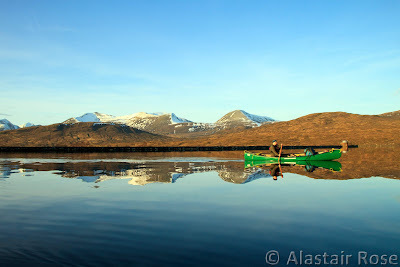 Frozen ground, no midgies etc though we did paddle in the dark every day and could certainly have made more distance with more daylight. Shuttle – its really long though very obvious. 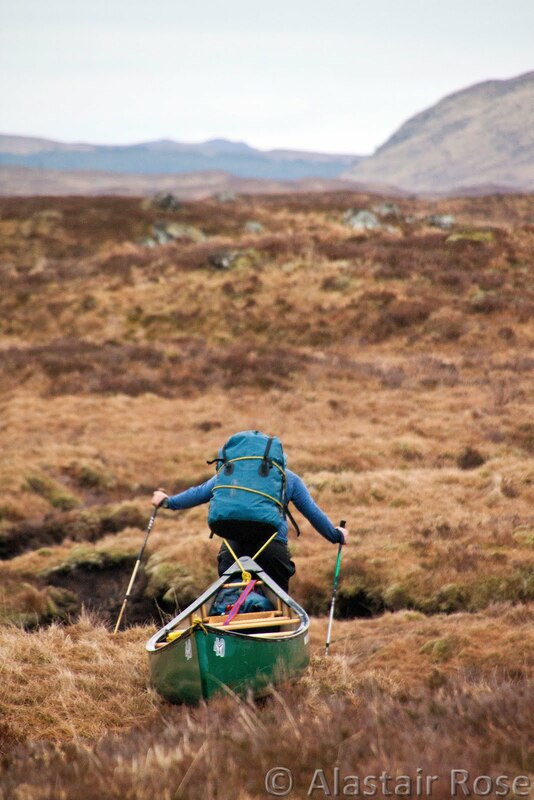 Route – It seems that some people portage down to run the Garbh Ghaoir (the river above the Gaur) but this doesnt really make sense as it is a further portage and doesnt quite make sense (to us) on a map.